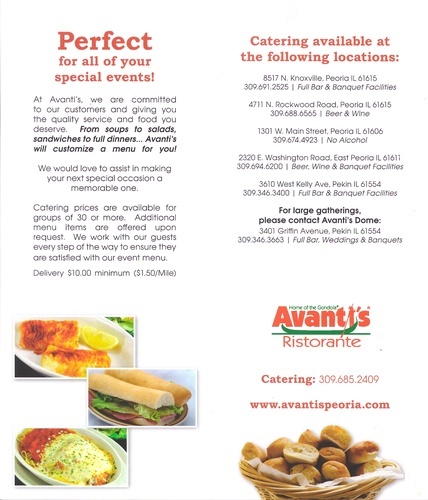 Avanti's of East Peoria, Inc.
Avanti's, an American Success Story that continues to live on today, is the brainchild of Albert Zeller, founder and CEO of Avanti's Ristorante. Born in the village of St. Galen, Switzerland, Albert grew up with eight brothers and sisters, where he learned the art of cheese making and processing other dairy products. In 1959 Albert moved to the United States and settled in the small town of Walnut, Illinois. His career aspirations were briefly interrupted by a two-year tour in the Army. While in service to his new country, he began developing new ideas for when he returned to civilian life. The old world charm of cheese making had served its purpose, and in 1964 a new corporation formed as a manufacturer of frozen pizzas. As manager and part owner of Gino's Pizza, and with only two employees, he produced 200 frozen pizzas a day. After fifteen months of hard work and solid sales promotion, those figures grew to 20 employees and 5,000 pizzas a day. The momentum didn't stop there. In 1966 he purchased Lardano's Italian restaurant on Main Street in Peoria, adjacent to Bradley University. 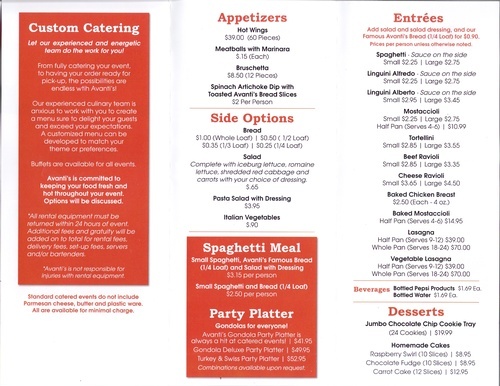 Soon after, the name was changed to Avanti's, which means ''forward'' in Italian and it was full steam ahead.